This morning’s sermon from First Pres, Boonville. The text is Mark 1:9-15. Three brothers grow up together in Dublin, Ireland. When they come of age and go off to make their way in the world, they make a pact: whenever they drink, they’ll always order three pints of Guinness, one for each brother. One of the brothers settles in New York, where he finds an Irish pub and becomes a regular. He explains the pact to the barkeep, who always knows to bring him three pints. Then, one fine day, the man comes in and asks for only two pints. The barkeep realizes that one of his brothers must have died. I think this guy has the right idea about Lent. He’s creative! He’s thinking outside of the box. Traditionally, this is the season of the church year where they really turn on the guilt. A lot of people talk about “giving something up for Lent.” This tradition got started way back in the olden days when new church members (called “catechumens”) would spend several weeks spiritually preparing themselves for baptism on Easter Sunday. They would pray and fast for extended periods of time, sometimes intentionally going without food for days on end. These guys (they were usually male), had a knack for going into great detail about the pains of hell that awaited those sinners who would face the wrath of God on the Day of Judgment. The only way out, they said, was to repent. And by repent, they mean: convert to (our version of) Christianity and feel really, really sorry for all your sins. Do that, and maybe (just maybe) God won’t burn you in hell for eternity. We’ve already talked about what “repent” means. What about the rest of it? As many of you already know, one of my favorite phrases in the entire Bible is, “the kingdom of God has come near.” A lot of folks like to think of “the kingdom of God” (a.k.a. “the kingdom of heaven”) as a happy place that exists way up on some cloud or in an alternate dimension where people go when they die, but that’s not how Jesus uses the phrase. Listen to what he says again, “the kingdom of God has come near.” Another way to translate “has come near” is “is at hand.” Let’s try something. If you’ve been hanging out here for a while, you’ve probably done this with me before, but we’ll do it again, just so the message sinks in. Hold your hand out in front of you and look at it. Jesus says, “the kingdom of God (heaven) is at hand.” How far away is heaven? As close as your own hand. And that leads us back to that word, repent. It’s has nothing to do with guilt or fear. It has everything to do with thinking outside of the box. The great scientist Albert Einstein once said, “A new type of thinking is essential if [hu]mankind is to survive and move toward higher levels.” Jesus is inviting you today to embrace the mystery of imagination and participate in the miracle of creativity. 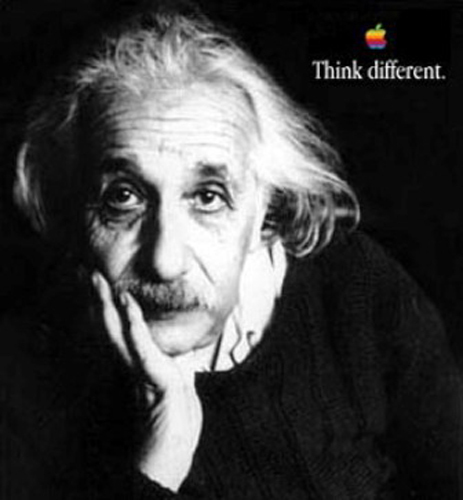 Think different in order to make a difference. That’s the “good news” Jesus is inviting you to “believe in” and be part of: the kingdom of God come near, the kingdom of heaven-on-earth.